Wish all of you a very Happy Sankranti!!! 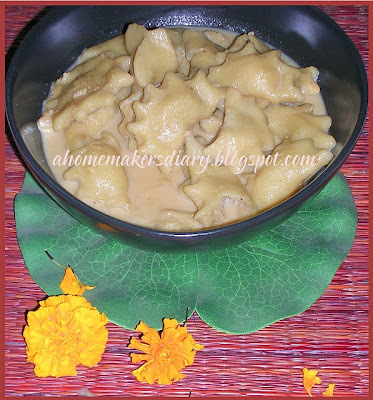 Being a food blogger one festival that I love is Poush Sankranti or Sankranti. It always bring a cheer not only to us who could eat the Sankranti special goodies but all farmers across India, as this marks the auspicious day when they bring home season's first yield of paddy. 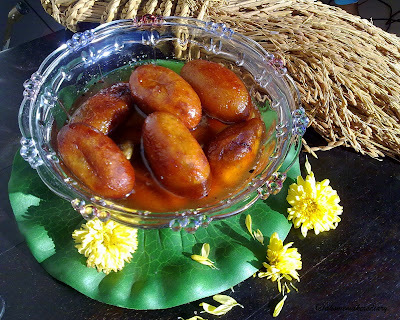 To celebrate this, different types of Pithe and puli are made. 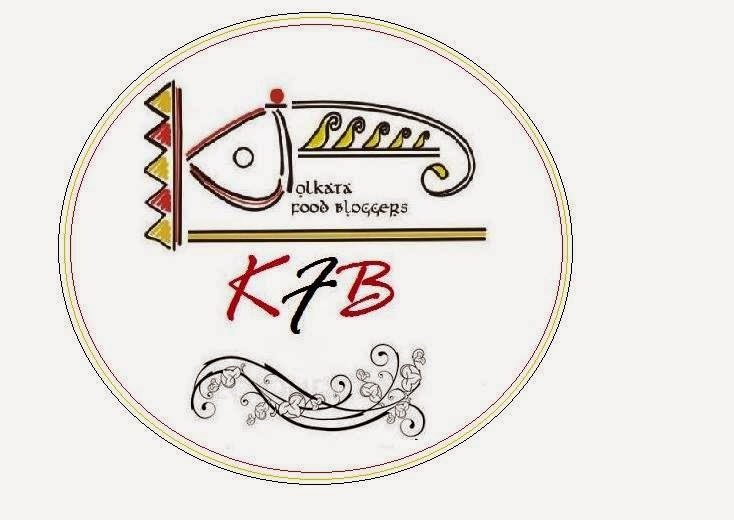 I already have written a post about this Bengali festival which you can see here. Though I was brought up in city but both my parents belong to the coastal part of the district Midnapore. I always have seen this festival being celebrated at home with much vigor and happiness. My Dida used to make Dudh Puli, SoruChakli (thin rice flour crepes), Patisapta, Askey Pithe (steamed rice flour dumpling with scraped coconuts and jiggery), Gokul Pithe (coconut fudge dipped in floor, fried and soaked in sugar syrup), Nonta Pithe (savory pithe) etc with lot of care and love. .
No matter where I am I make it a poin to eat my share of Poush Sankranti special goodies mosty of which are delectable sweet dishes. 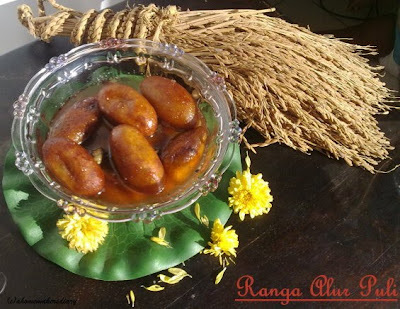 This year I made Ranga Alur Puli or sweet potato dumplings stuffed with sweet coconut and soaked in sugar syrup. This is the first time I tried my hand in this and it has turned out devilishly delicious. The dark thin outside with a creamy sweet steeped inside…a true joy to all your senses. It tastes a lot like gulab jamun and sometimes this sweet is made in round shapes also which is known as ranga alu’r Pantua. No more blabbering on this and better I go staright to the recipe now. 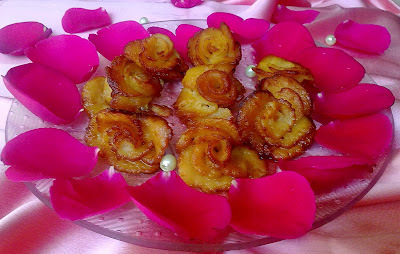 But before that here are some other pithe I cooked on the blog till date. Sweet Potato: 2 pieces; I used 4 medium sized sweet potatoes which has yielded me 22 Pulis. So 2 pieces will give almost 10-12 sweets. Boil or steam the sweet potatoes. Though lengthy but the best process is to steam the potatoes, as it will lessen the moisture content. If boiling, boil them whole in a pressure cooker for one whistle on medium high flame. Drain the water, peel and mash as smooth possible. Mix in the flour and knead to a semi firm dough. The dough would be sticky so if needed add some more flour. Cover with cling film and put in fridge for 30 minutes. In the mean time put all the stuffing ingredients in a heavy bottomed pan and cook till it becomes dry and leaves the side of the pan. Cool completely before using.for the process check here. Also put the sugar and water in a pan and bring it to boil. 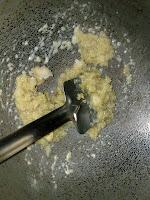 Add crushed cardamom and reduce the syrup till a little thick. Keep it warm. Take out the sweet potato dough and take in spoonful. 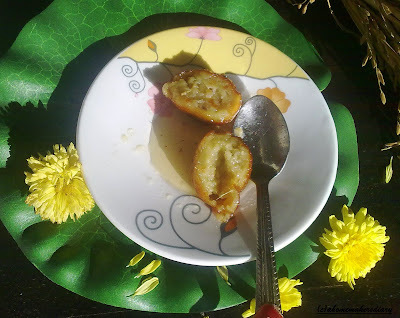 Stuff with sweet coconut mix and roll in floured hands. 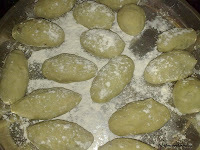 Roll them in shape of puli as shown in picture or you can make round balls as well. Repeat with the rest of the dough and deep fry them in hot oil. Once lightly browned on all sides, transfer to the warm sugar syrup. When they are soaked enough serve hot or cold. These could be stored in fridge in a covered container. Am sending this to Sugar high Friday, hosted this month by Kate of A Merrier World. this lovely event is the brainchild of Jennifer, the Domestic Goddess. also sending this for the first time to DMBLGIT hosted this month by Nidhi of Snacksgiving.this very unique event is a brainchild of Andrew of Spittoon and SpittoonExtra. Delicious and absolutely delightful recipe. Happy Sankranti! to you. wow, looking so good! You are a queen of making Indian sweets! Love the sweet potatoes used, this is a new way of using sweet potatoes to me. Happy sankranti to you too! wow..what clicks!! 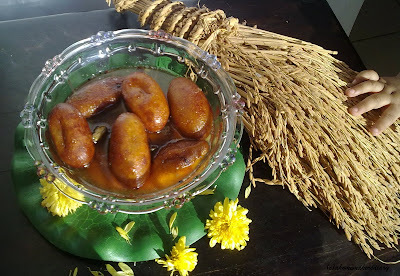 too good..looks absolutely delicious..happy makar sankranti!! Happy Sankranti !! 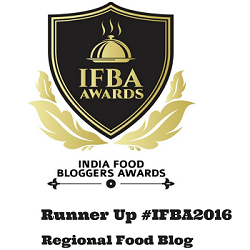 Everything looks awesome....I'm die hard fan of desserts..Am drooling now..Thanks for your visit and the wishes..See you often !! 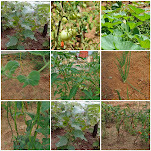 Awesome clicks..My fav is still the rose garden..
Wow sweet looks fantastic!! I have a close friend who is bengali, will def try this soon, thanks! Will keep coming back to your space for more. Those sweetmeats are great and lovely! It's yummy and alluring! Happy Sankranti! Love that sheaf of paddy, not to mention the post itself! Sra, even I love that paddy bunch and keeping it for 3 yrs now. but the rats had eaten half of it. I understand it completely Soma. amar bari eso anek bangali ranna kore khaoyabo. Wow, It's made with sweet potatoes, that must tastes amazing, I love sweet potatoes! Great recipe! I don't mean this in a bad way, of course! Ethical concerns aside... I just hope that as technology further innovates, the possibility of copying our memories onto a digital medium becomes a true reality. It's one of the things I really wish I could see in my lifetime. I can't thank you enough for this recipe. Never learned it when my mom was alive and for last 3 years, none of my relatives could help me with ranga alu-r puli...never crossed my mind I could just google it :) God bless you! @Anon, Thanks. appreciate your comment and you truly made my day.